The state of Maine is planning to consolidate and modernize Belfast District Court and Waldo County Superior Court, and so the district court building would be returned for the sole use of Waldo County, which owns it. 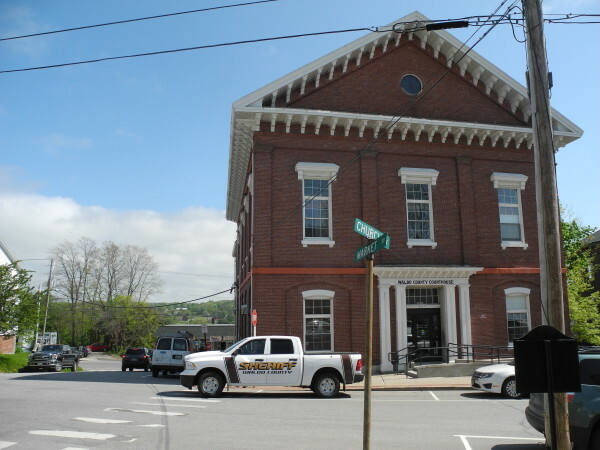 Belfast city and Waldo County officials hope the Maine Judicial Branch will consider renovating the Waldo County Superior Court, built in 1853, to be the county's consolidated court facility. That would require the city to move Market Street and the state to acquire some nearby properties, according to Belfast City Planner Wayne Marshall. 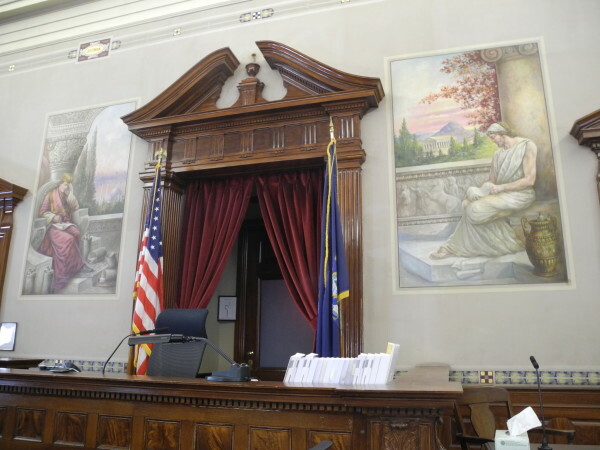 Two murals that likely were painted during the Great Depression adorn the wall behind the judge's bench at Waldo County Superior Court. If the Maine Judicial Branch constructs an entirely new, $17 million combined court facility in Belfast, there are currently no plans to do anything with the murals, according to Mary Ann Lynch, spokesperson for the judicial branch. 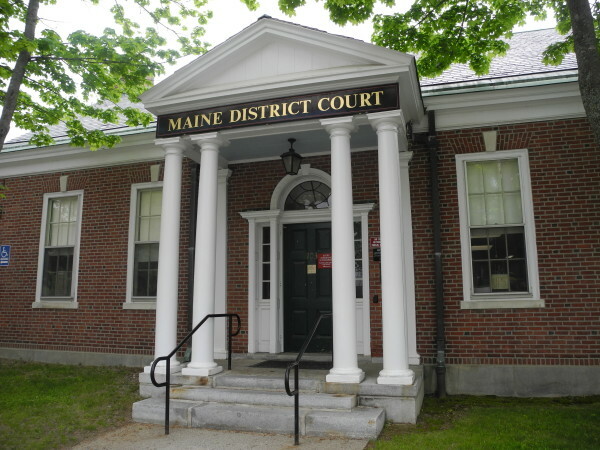 BELFAST, Maine — Major changes will be coming to Belfast’s judicial landscape soon, as the state of Maine has decided it is past time to consolidate, upgrade and modernize the city’s two existing court buildings — one of which was built back in 1853. This spring, Gov. Paul LePage signed Public Law 468, an act to modernize and consolidate court facilities, which authorized spending up to $95.6 million on projects in Oxford, Waldo and York counties. The state recently has modernized the courts in Bangor, Augusta, Houlton, Dover-Foxcroft and Machias. Lynch said the state is planning to construct a new, $17 million combined court building to replace the Waldo County Superior Courthouse, built in 1853, and the Belfast District Court, built in 1930. If that happens, Maine will return both buildings to the sole use of Waldo County, which owns them. However, Belfast City Planner Wayne Marshall said the city is hoping the state will consider renovating and expanding the superior court building. That imposing brick structure stands on the corner of Market and Church streets, right next door to Belfast City Hall. Although the state determined about six months ago that there isn’t enough space on the corner to renovate the 1853 building, that may change, Marshall said. City officials told Waldo County Commissioners earlier this month they are willing to relocate Market Street so the state of Maine could have more space to renovate the courthouse. The state’s desired renovations include building a sally port to make it safer to bring in incarcerated defendants and creating more parking spaces for workers and the public. Marshall said it likely would be easier for the county to repurpose the 1930 district courthouse, located a couple of blocks away on Church and Spring streets, than the older superior courthouse. “And that means an abandoned building,” he said of the superior courthouse building. In the superior court building, murals painted in the 1930s make a dramatic backdrop behind the judge’s bench, and people access the second-floor courtroom via two curving staircases. Waldo County Commissioner Bill Shorey said recently he is happy the state has decided to “do something” with the Waldo County courthouses. When the new unified court is built, Waldo County government, now located in the basement of the district court building, is planning to expand into the rest of the building for its offices and needs. Lynch said that while the state is planning to construct a new building, if the existing courthouse and site could be reconfigured within the state’s budget to meet future requirements, it would be considered along with other proposals. The Maine Judicial Branch will be issuing a request for information about property this summer. Lynch said the state already has considered and rejected the former Crosby High School, a large downtown structure that is for sale. Among other things, the judicial branch is looking for a fully useable, developed site of 1.75 acres, a building footprint area of 13,350 square feet, setbacks adequate to protect the building and occupants against external security threats, public parking for 69 cars and prominent visibility of the building entrance from a main public street. Once completed, the new or renovated building would include three courtrooms; a modern design that allows separate circulation routes for the public, jurors, court staff and incarcerated defendants; secure holding facilities; and an entry screening area for all public visitors. According to the judicial branch, the project architect will be hired this July, the design will be completed by January 2017 and construction will be completed by June 2018. Marshall said the tight timeline could complicate efforts to renovate the existing superior court house. To do that renovation and expansion, the state likely would need to acquire nearby buildings including Duval Auto Services and the American Legion Hall. Market Street also would have be moved over to accommodate the expansion.